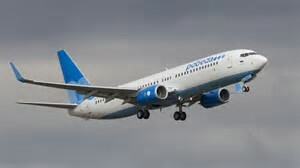 Aviation Partners Boeing (APB) announced today that Russia's Pobeda Airlines will be the largest operator in the Russian Federation of its latest Split Scimitar Winglet technology. Pobeda Airlines intends to install the Winglets on its fleet of Boeing Next-Generation 737-800 aircraft beginning this week. Aviation Partners' latest Winglet design, the Split Scimitar Winglet, uses existing Blended Winglet technology but adds new aerodynamic Scimitar tips and a large ventral strake, further increasing the efficiency of the aeroplane. "Pobeda is taking steps to be the most fuel-efficient and environmentally friendly airline in Russia," says Aviation Partners Boeing director of sales and marketing Christopher Stafford. "After a thorough evaluation of the Split Scimitar Winglet System, Pobeda clearly recognized the enhanced performance and improvement to the operating economics of the Boeing Next Generation 737-800 fleet. Pobeda is not only establishing itself as the leading LCC in Russia but also as the most technologically advanced airline." per aircraft, and their carbon dioxide emissions by about 530 tonnes per aircraft per year. "At Pobeda, we are dedicated to providing our customers with low fares paired with an excellent customer experience. To achieve low fares, we need to focus on our costs at all times. This is the reason why we have chosen to install Split Scimitar Winglets on our brand new aircraft," says Pobeda Airlines CEO Andrey Kalmykov. "Fuel saving is one of the key factors of success for all airlines – especially for an LCC. The introduction of this innovative product underlines our commitment to deliver reliable air traffic operations with low fares to the Russian market." Since launching the Boeing Next-Generation 737 Split Scimitar Winglet program APB has taken orders and options for 1,800 systems, and nearly 1,000 aircraft are now operating with the technology. APB estimates that its products have reduced aircraft fuel consumption worldwide by over 7.7 billion gallons to-date thereby saving over 81 million tons of carbon dioxide emissions.